Do you feel like your friends and families are ready for the arrival of the zombie apocalypse? Yeah, we don't think that the people around us are ready for it either. They keep saying it's not going to happen. Going so far as to send us articles about how it's not scientifically possible. Want to know what we think? Most likely not but we'll tell you anyway, we're pretty sure they're trying to get us to let down our guard and give them some of our apocalypse supplies. Yeah, that won't happen until they start doing zombie drills with us! We're not sharing our bottled water with freeloaders who don't know how to use random household objects to protect our backs. Here's the thing, want people to get on board? They need to be as fearful as us true believers. Okay, maybe you simply want to creep people out this Halloween season, that's cool too! 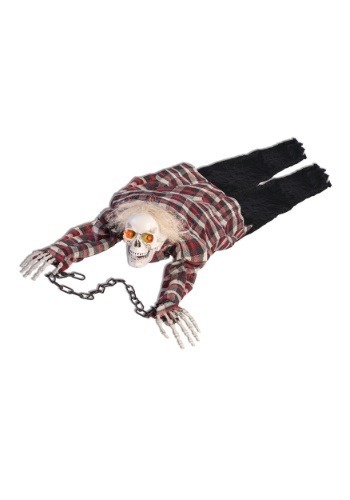 That's a goal that is easily achieved when you've got this crawling skeleton in the house! It is motion activated so once it's on, it will crawl towards anyone who is hopping around and shrieking. Operated with three AA batteries, it makes groaning noises so people know he means business. The skeleton looks like he's escaped from the basement. If this doesn't get people into the terrified Halloween spirit, we don't know what will! So, next time you're having a casual dinner party and the conversation starts to lull, don't rely on boring weather talk. Set this horrendous ghoul on your guests. It's sure to turn into an evening that no one will ever forget. Whether this guy is out for the night to chase down trick-or-treaters or you're having a spooky Halloween party, you're sure to have a great time with this crawling skeleton.